A friend who was passing through Dubai was kind enough to buy me this little coffee set. 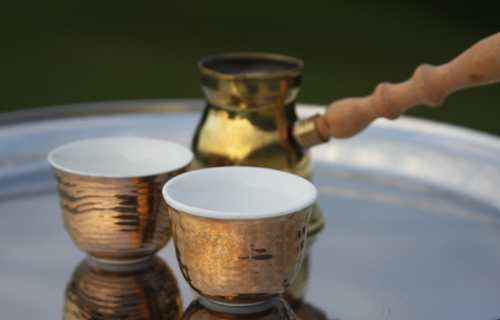 The brass thing with the handle is called an "Ibrik" and it's used in the traditional preparation of coffee in that corner of the world. Basically, the coffee is ground extremely fine (to dust, more or less), mixed with water, and slowly allowed to come to a boil three times before being served in the small cups. Many times, cardamom seeds are ground up with the coffee. Well-prepared coffee has a thick foam on the top and does not contain noticeable particles in the foam or the liquid. I haven't tried this method at home but when I do, I'll post the results.